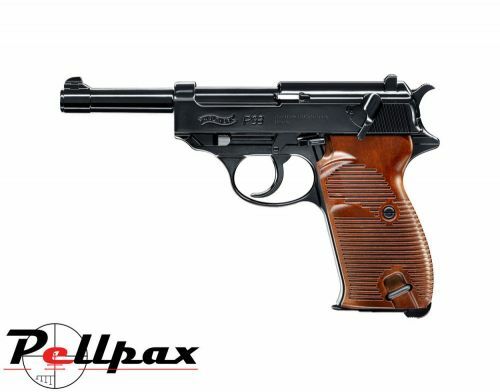 This new Umarex Walther P38 replica pistol uses a 12-gram CO2 cartridge and fires in semi-auto. This has a 20rd drop-free BB mag that takes 177/4.5mm copper/steel BBs. This has a very nice blowback action with a 2-stage non-adjustable trigger. This has a very nice gloss black finish with fixed sights. This should get about 40-50 shots from one 12g Co2 capsule. This is an authentic replica of the original pistol with realistic weight and feel.